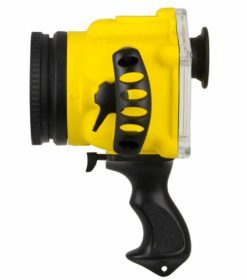 Liquid Eye is the first water housing company to design a small form factor water housing specifically for the smaller entry level DLSR models made by Canon and Nikon. Our model C2050 follows the same innovative design principles of the larger model C2100. 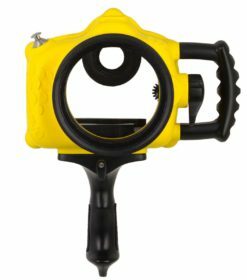 All C2050 housings feature a rugged high strength PU resin case, a modular detachable M-LP port system, an integrated manual zoom control and a detachable dual stage auto-focus/shutter release pistol grip. The C2050 comes in two versions- Standard and Advanced. 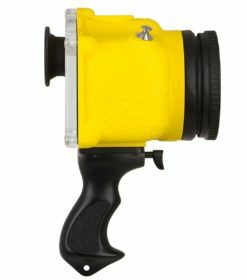 Our Standard water housings are for photographers that don’t use camera back controls and have no need for an auxiliary front shutter control, but would like the option to add those controls later. Standard housings are otherwise identical to the Advanced water housings in every way. Our Standard model is for those without the need or the budget for Advanced controls. Our Advanced model has all the features listed above for the Standard model plus select camera back controls and an auxiliary front shutter button control. The Advance model delivers greater artistic control and in some models enables switching between video and stills on the fly. The auxiliary front shutter control is an essential feature for those who wish to use our double handle grip when shooting video or stills. For owners of entry level Canon and Nikon cameras, the model C2050 is a welcome game changer.